Why should hotels start a mobile PPC campaign? Mobile search is a rapidly growing segment of overall search volume. 67% of travelers and 77% of frequent business travelers with web-enabled mobile devices have already used their devices to find local services (e.g. lodging) (source: PhoCusWright). This year there was a 400% increase in mobile searches over last year. PPC for mobile search allows hotels to target ads to users who are searching in their geographic area, converting local searchers into room nights booked. Mobile search is an ever growing trend, and along with it, mobile pay per click. With 82% of smartphone users noticing mobile ads, mobile websites and mobile ppc campaigns should be a top priority for business owners (Google Think Insights). As shown in the image below, in the first six months of 2011, we saw over 5,000 clicks between our two mobile PPC campaigns to the mobile website. Don’t Have a Mobile Website Yet? With 77% of smart phone users using search engines as a main source of information, it isn’t necessary to have a mobile website to have a successful mobile pay per click campaign (Google Think Insights). While a mobile friendly site will increase the effectiveness of your campaign, using features such as click-to-call can improve the click rate by 6-8% according to a mobile search analysis conducted by Yahoo! The two mobile campaigns for a hotel illustrated below cost a total of $367.98 for the month of June, and generated 67 calls and 8 reservations for the hotel through the click-to-call feature. With an average daily rate of $150, the click-to-call feature alone generated over $800 in profit. Target non-branded keywords: Of 3 campaigns analyzed, non-branded keyword terms outperformed branded keywords in Mobile PPC. Even with a lower average position, the search volume for non-branded terms led to a higher number of clicks on ad headlines and phone numbers. In the example below, non-branded keywords drove a total of 76 clicks on the headline and phone number, while the branded terms drove 48 clicks. Hoteliers should utilize mobile search to capture searchers who are further along in the transaction process. Taking advantage of the rapid increase of mobile searches is a way for business owners to stay ahead of the curve. 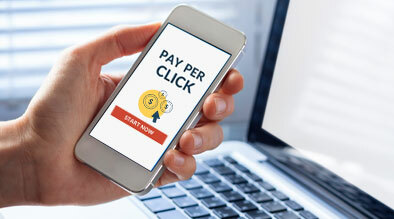 When building a mobile PPC campaign, hoteliers should make sure to target non-branded and branded key terms and make use of the click-to-call feature.